In order to achieve a better characterisation of a whole failure process, models which combine damage and fracture mechanics have recently been proposed. Here, a new combined methodology is presented: in order to describe damage inception and its diffuse propagation, a gradient-enhanced continuum model based on smoothed displacements is used, which is coupled to a discontinuous one to describe the final stages of the process. Special emphasis should be placed on the difficulties concerning the transition between continuous damage growth and fracture. On the one hand, and in order to conserve the energy dissipation through the change of models, an appropriate cohesive law must be defined. In this paper, the proposed technique to define this law is explained. On the other hand, the direction of the crack path should be determined. Here, a new strategy is proposed: the discontinuity is propagated following the direction dictated by the medial axis of the damaged domain. That is, a geometric tool, widely used in the computer graphics field, is used here to locate cracks. Tamayo, E.; Rodriguez, A. 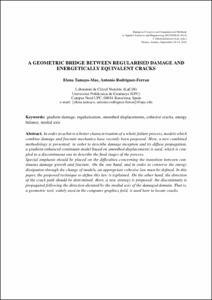 A geometric bridge between regularised damage and energetically equivalent cracks. A: European Congress on Computational Methods in Applied Sciences and Engineering. "ECCOMAS 2012: 6th European Congress on Computational Methods in Applied Sciences and Engineering. Programme book of abstracts, September 10-14, 2012, Vienna, Austria". 2012, p. 1-13.